Automatically bends and shears deformed reinforcing steel, #2 (6mm) through #4 (12mm) dual strand and #5 (16mm) single strand. The Multi Form 1016 M handles coiled or straight reinforcing steel stock. By having the option to run either coiled or straight stock, shortages are avoided, lowest priced material can be used, and dual inventory on bar sizes #3 (10mm)-#5 (16mm) is eliminated. The bar puller pulls #2, #3, #4, and #5 (6-16mm) straight stock bar out of a bundle. No shakeout is required. 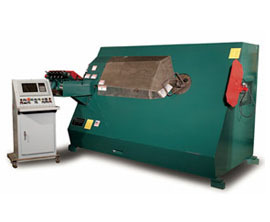 KRB utilizes a patented secondary drive roll which reduces the remnant/scrap to a minimum of 10" (250mm). Otherwise, the remnant could be 4-5' (1200-1500mm) depending on the location of the primary drive rolls as on conventional automatic stirrup benders. The horizontal straightener hinges out of the way for running straight stock.